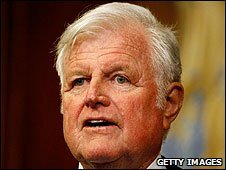 Veteran US senator Ted Kennedy is to be awarded an honorary knighthood. The Queen has agreed the honour for the brother of former US president John F Kennedy for services to the US-UK relationship and to Northern Ireland. Gordon Brown formally announced the award to the 77-year-old during his address to both houses of Congress. The prime minister's speech came on the second full day of his visit to the US, which featured brief talks with President Obama on Tuesday. Senator Kennedy, who is being treated for a brain tumour, was unable to attend Congress for the speech. In his address Mr Brown said: "I hope that you will allow me to single out for special mention today one of your most distinguished senators, known in every continent and a great friend. "Northern Ireland is today at peace, more Americans have health care, more children around the world are going to school and for all those things we owe a great debt to the life and courage of Senator Edward Kennedy. "And so today, having talked to him last night, I want to announce that Her Majesty the Queen has awarded an honorary knighthood for Sir Edward Kennedy." Mr Kennedy has been a senator for his home state of Massachusetts for more than 46 years. The most senior living member of the famous Irish-American political dynasty, he was diagnosed with brain cancer in May last year after being rushed to hospital with stroke-like symptoms. He has since had chemotherapy and radiation to treat the malignant glioma, an aggressive type of brain tumour. Mr Kennedy suffered another seizure during President Barack Obama's inaugural lunch in January, but was released from hospital a day later. The father-of-five was elected to the US Senate as a Democrat in 1962 following the election of his brother as president. Apart from his famous family connections, he is probably best known in the UK for his work on the Northern Ireland peace process. He has been intricately involved in politics there, meeting Sinn Fein leader Gerry Adams and other politicians during and beyond the Good Friday agreement. He famously snubbed Adams during the latter's St Patrick's Day trip to the US in 2005 following the brutal killing of Robert McCartney. The IRA, closely allied to Sinn Fein, was accused of involvement in his murder. Mr Kennedy joins a select band of overseas nationals given an honorary knighthood. 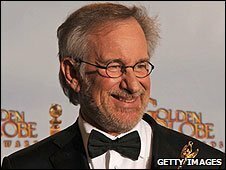 Microsoft billionaire Bill Gates, former president George Bush senior, former mayor of New York Rudolph Giuliani and the film director Steven Spielberg have also received the honour.